Where is it? : This park of 267 hectares follows the course of the Onkaparinga River from Main South Road, Old Noarlunga to Commercial Road, South Port Noarlunga and is bounded on the east by River Road. It can be accessed by Bus Routes 745 or 747 from the Noarlunga Centre Interchange (Seaford Circuit: Stop 74 on Saltfleet Road, Stops 75 or 76 on Commercial Road, Stops 76A, 76B or 76C on River Road). 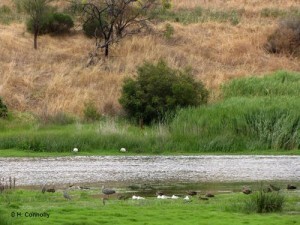 The area is often referred to as the Onkaparinga Wetlands. Habitat: The floodplain and surrounding areas are covered by a combination of open shrubland with Nitre-bush (Nitraria billarieri), Lagoon Saltbush (Atriplex suberecta), Marsh Saltbush (Atriplex paludosa ssp. cordata) and Sea-berry Saltbush (Rhagodia candolleana ssp. candolleana), native grassland and introduced pasture. Along and near the river areas of there is Common Reed (Phragmites australis), samphire flats with Thick-head Samphire (Sarcocornia blackiana), Grey Samphire (Tecticornia halocnemoides ssp. halocnemoides, Shrubby Samphire (Tecticornia arbuscula) and areas of revegetation. The aquatic estuarine flora is dominated by Garweed (Zostera muelleri).